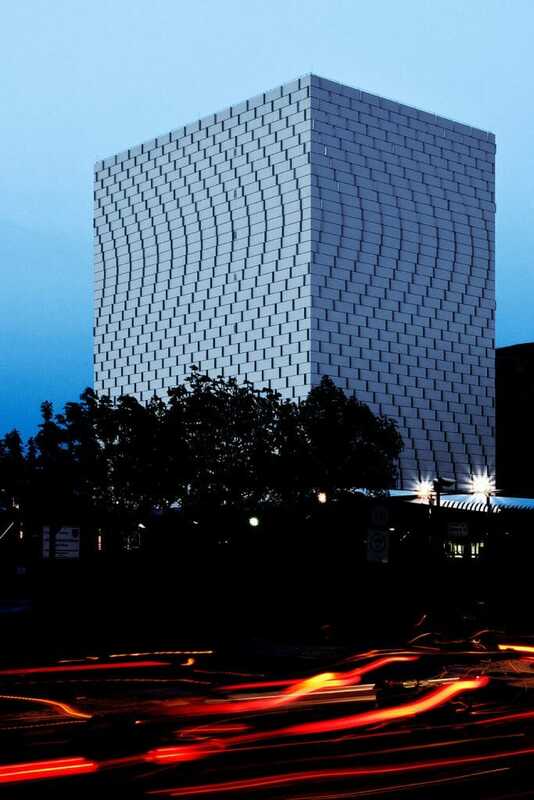 An oversized cube with an undulating façade grid enriches the prospering architectural scene of the Hungarian capital. Optical dynamics and movement are created in the large surfaces by geometric offset and over-corner alignment of the vertical joints, three-dimensionally underlined by rectangular slats. The Hungarian pharmaceutical company Richter Gedeon commissioned the architects Csaba Nagy and Dániel Déri with the ambitious task of renovating the facade of the windowless and unadorned tower-like warehouse building at the headquarters in Budapest and making it an eye-catcher. The task was not only to overcome the desolation of the weathered 50 year old metal facade. In addition, it was urgently necessary to restore its energy efficiency to an efficient level. No complicated facade technology was required for the renovation. 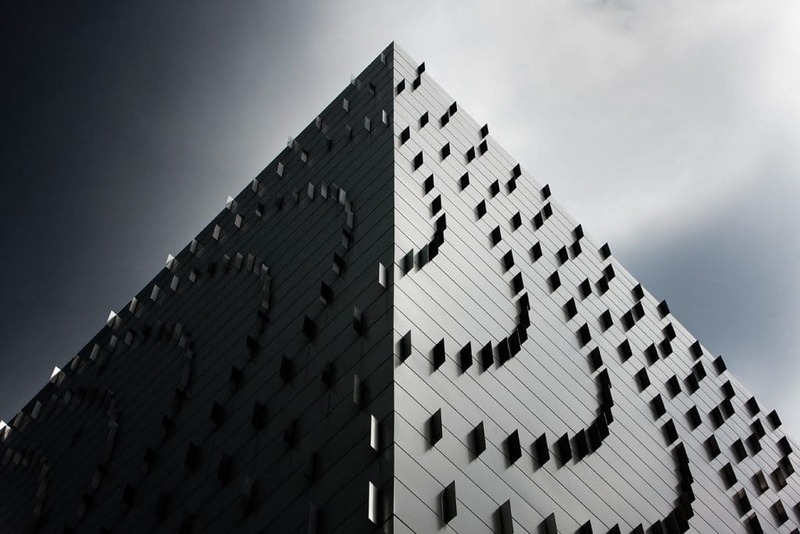 Only the usually cross-shaped grid of the selected DOMICO Planum façade was shifted horizontally to the side in each layer according to a given design principle. This, however, was consistently done in the standardised panel length dimension over all corners around the building. This results in surfaces – even adjacent ones! – The parabolic arches overlap each other optically and swing over corners, so to speak, softening the hard edges of the cube. In addition, profile-width metal plates were installed in all vertical joints, marking their three-dimensional offset. 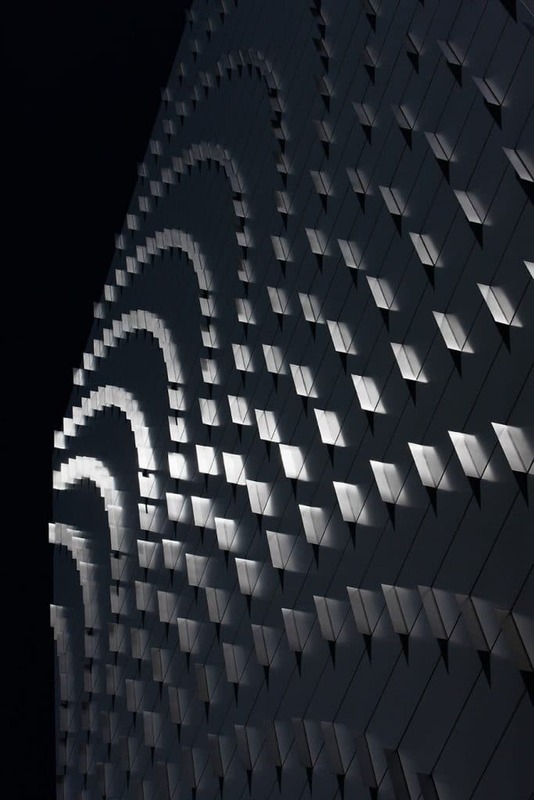 Under different lighting conditions, these right-angled louvres form reflecting shiny surfaces and sharp-edged shadows and thus intensify the course of the parabolic patterns, which dominate the flat façade surfaces. From the overall effect of all the design components, the building is given an individual contour that conveys movement and dynamism with subtle refinement. However, the construction phase was not without surprises. Only when the old façade was dismantled did it become apparent that the outer walls of the upper four storeys were not solidly concreted, but only filled with 10 centimetre thick bricks. Because the façade was to be constructed from top to bottom – while the scaffolding was to be dismantled – this meant a fundamental change in the construction concept in this area shortly before the start of assembly. For structural reasons, it was not possible to anchor the 18 centimetre thick rock wool insulation panels in the thin-walled infill, as had originally been planned and was also carried out in the lower part of the building. For this reason, a closed shell of DOMICO cassettes was mounted vertically outside the masonry wall and anchored back in the concrete ceilings. 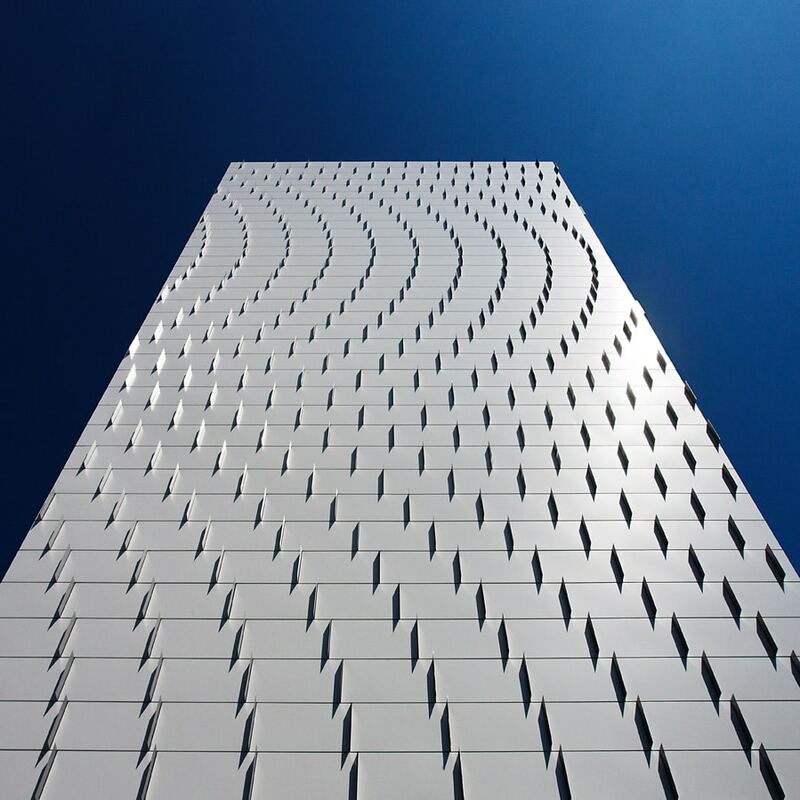 This statically loadable shell carries the Planum profiles of the full-surface rear-ventilated exposed façade via a spacer profile, so that their overall appearance did not have to be modified on the outside. With the cassettes, vertical alignment with the standard facade insulation could also be achieved without any problems. The architectural quality achieved with a high “eye-catcher” factor should not, however, make us forget that Warehouse II was also intended to serve as a role model with regard to the energy efficiency to be achieved. In the course of the facade renewal, the exterior walls were thermally insulated to U values of 0.25 W/m2K (requirement 0.45 W/m2K); the roof surface was thermally insulated to U value 0.19 W/m2K. In connection with the renewed building technology, a total energy saving of 80 percent is expected, so that the energetic improvement of the impressive building can also be “seen”.